Children from birth to nine years old need special support to develop their bodies, minds and emotions in the the best possible way. 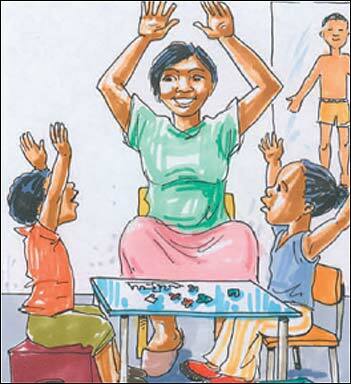 Children who have attended a properly run crèche or preschool, have a great advantage over those who have not. Help your children. 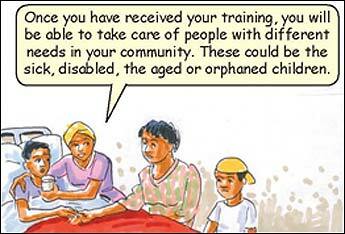 Help other people's children. Give them the great start in life that will help them develop their talents to the full. 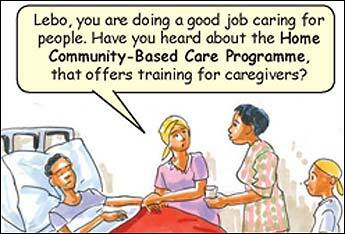 The Home Community-Based Care Programme helps formal and informal caregivers in communities to give health and social services to people who are in need. help with family planning, burials and getting grants, and other services. This course is SETA-accredited. Successful trainees can start a facility, apply for a Home Community-Based Care grant to run the facility, and train others to work as Home Community-Based Caregivers. 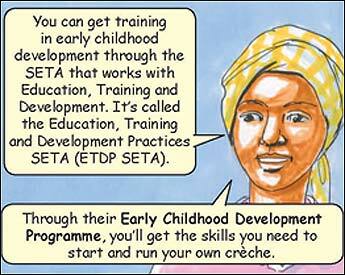 Some of us who received training on these programmes have started our own businesses. We used the opportunity not only to gain employment, but to learn skills for the future! 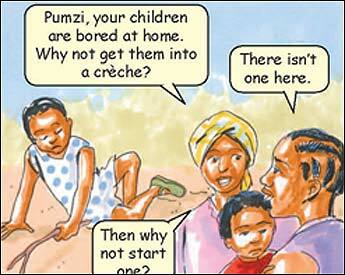 This panel first appeared in Building a People's Contract for Growth and Development, a booklet published by Government.